U.S. Secretary of the Treasury Henry M. Paulson Jr. speaks during a press conference October 10, 2008 in Washington, DC. 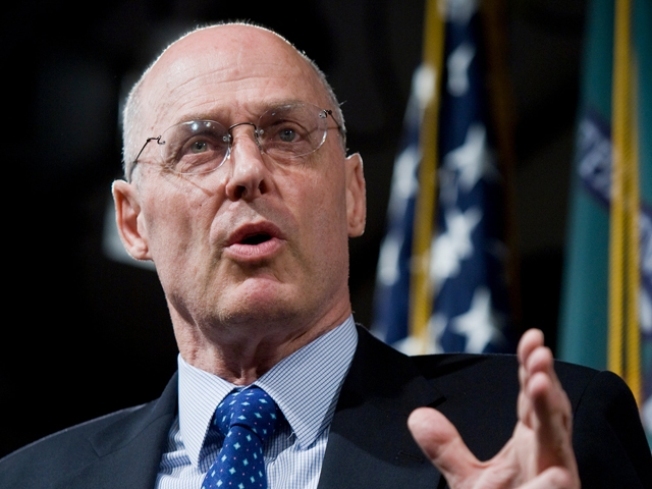 As the financial crisis threatens to spiral out of control, it’s more likely Treasury Secretary Henry Paulson will take extraordinary steps through the extensive authority granted to him under emergency rescue legislation, say analysts. With the legislation’s main mechanism—an auction system to purchase bad mortgage-based securities—still weeks away from implementation, Paulson may have to inject capital into any number of financial institutions—even non-depository ones like investment banks, insurers and hedge funds. “I don't wish to spread alarm on the line people but the big issue confronting the market is I'm afraid the health and sustainability of Morgan Stanley (NYSE: MS) and Goldman Sachs (NYSE: gs)," Hugh Hendry, Partner and CIO at Eclectica, told CNBC. "It is unimaginable that they can be allowed to go, I suspect that they will be nationalized at some point today or over the weekend," he add. Some say the Emergency Economic Stabilization Act of 2008’s vague language gives Paulson almost unlimited power to intervene. “He’s free to just strike deals, to do special deals,” says Lawrence White, a former White House economist and savings and loan regulator, who adds Congress was aware of the powers being given to Paulson and thus pressed hard for an oversight board. Like the auction process, however, that board has yet to be set up, and with developments in the financial markets moving much faster than the Washington bureaucracy it might not be long before Paulson takes action. Indeed, on Thursday Treasury indicated it would move by the end of the month. In a brief speech on Friday, President Bush promised the department would move quickly. Independent bank analyst Bert Ely, who says he’s read the new law closely, sees no such specific authority for the Treasury in the EEA. "Presumably they have the authority some place—in this legislation or otherwise," he adds. A staffer in the House Financial Services Committee says Congress was aware that the EEA would authorize the Treasury Secretary to make cash injections separate to the auction process. When asked, if that authority also applied to non-depository institutions, the staffer was non-committal. It's unclear if those injections would have to yield an equity stake. “I've got to think they have that figured out, to interpret the legislation broadly enough that they can do it," says Ely. A government move to prop up an investment bank-turned bank-holding company, such as Morgan or Goldman is all the more likely given the growing consensus that says Paulson and Federal Reserve Chairman Ben Bernanke erred in not rescuing Lehman Brothers three weeks ago, a date which happens to coincide with the beginning of the market’s deep descent. Pressure has been mounting on Morgan Stanley for days now, amid growing speculation Japan's Mitsubishi UFJ will not proceed with plans to purchase a major stake. Goldman shares, in contrast, have held up relatively well compared to the broader market. In publicly acknowledging that it is "seriously considering" capital injections Thursday, the Treasury is recognizing it “might have to do something different,” says Dean Baker, co-director of the Center for Economic And Policy Research. In his news conference Wednesday, Paulson said the “primary motivation” of the government’s efforts was to lead to the “recapitalization” of the financial services industry, but he avoided outlining what circumstances would determine whether institutions would be allowed to fail or the government would step in to save them. He also declined to comment on whether he would consider a bank nationalization plan, such as the $77-billion one announced by the UK. “That's always going to be the answer," Isaac explained. There’s also a sense that the concept of moral hazard may have become something of a luxury item in the current meltdown. The Fed and Treasury have already taken a number of unusual steps, from paying interest on bank deposits to backing up the commercial paper market to providing more than $100 billion in loans to the insurance giant American International Group. On top of that, there’s a growing chorus calling for governments to guarantee banks’ liabilities, which essentially separates credit risk from funding, and may encourage more lending among banks. "They're prepared to do almost everything,” says Ely.